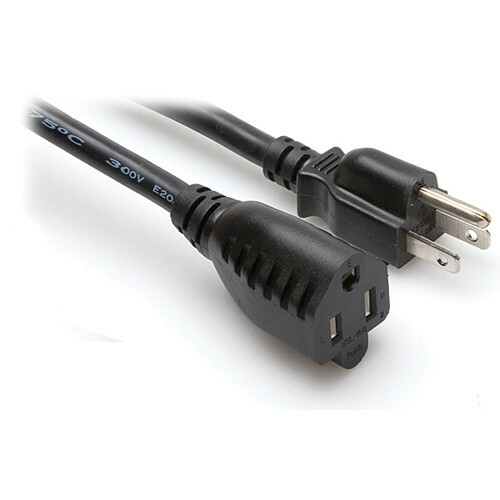 The NEMA 5-15R to NEMA 5-15P Power Extension Cord by Hosa Technology is designed to extend power cords for computers, monitors, printers, scanners and most any other device with a NEMA 5-15 connector. This cable features three, OFC (Oxygen-free Copper) conductors for increased current flow, a flexible and inconspicuous black PVC jacket and 14 AWG cable for long-lasting durability. Box Dimensions (LxWxH) 6.1 x 3.4 x 1.3"
NEMA 5-15R to NEMA 5-15P Power Extension Cord- 8' is rated 4.5 out of 5 by 2. Rated 4 out of 5 by JCtheTech from perfect thing for getting those extra 4' Bought these to get wall mounted speakers to the outlet without having to use an extension cord. The previous cords were only 5' , and were just short of the outlet. Have a few extras, as I know they will be needed around different desk setups. Having to run a 15' extension is super annoying when you are only short a few feet, this fixes that. Seems durable. Rated 5 out of 5 by Trumps from Awesome. Low on outlets and iPad wasn't charging due to a power strip plugged into a power strip. Used this to run power frm unused outlet under couch and everything charges like a charm. Gonna get another one.